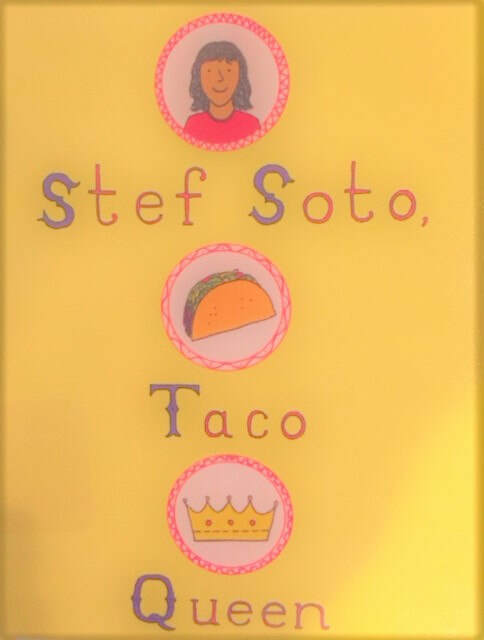 "Taco Queen" isn't a title Estefania embraces - it's something a mean-girl-who-used-to-be-a-friend bestowed upon her. Now that she's in middle school, Stef feels differently about her family's taco truck, and even about her father, who sometimes picks her up in the truck after school. Besides, she wishes her parents weren't so over-protective - they just have to let her go to a concert with her best friend - but will they? Stef is used to long hours working the cash register and preparing food, and to doing homework in the truck while her father cooks. When a city proposal to change rules about food trucks threatens the family business, Stef's father asks her for help to read and talk about the details in English. She's also getting involved to help preserve the art class budget at school, by organizing a fundraising dance. Will all her plans come together, or will everything come crashing down? Although the main character is in middle school, this book is written in a style familiar to upper elementary readers. Although the plot summary might suggest there's too much going on, it's woven very skillfully together. Stef is not an unrealistic hero or a perfect daughter - she has conflicting desires and the book explores them in believable ways. This is a charming story about a young person who tries to make a positive difference. I appreciate the fact that she doesn't get everything she hopes for, and the story shows her moving forward and dealing with each hurdle, piece by piece. It's more inspiring than it would be if everything turned out perfectly. Warning: the food details may make readers hungry! "Stef Soto, Taco Queen quote."